Flying into Singapore on what is actually my second visit there, I am looking forward to exploring the globally renowned airport, Changi – glimpses of which my memory had captured in my previous, brief transit stopover. And this time, with an agenda that will have me spending the better part of two days on its premises, I feel that I may morph into the Tom Hanks-like character from The Terminal – but with a difference. And what a difference it proves to be. Landing at Terminal 3, I sail through all the formalities and am escorted to the hotel where I am to stay – Crowne Plaza – just a hop, step and stroll away from Terminal 3. My room, on the eighth floor, affords me a runway view that has me awake for most of the hours, as I sprawl on the soft carpeted floor, watching flights take off and land. Next morning, after breakfast – where I am introduced to a local treat – kaya (coconut jam) on toast – I step out into the embracing environs of Changi Airport where not even the most direction-challenged individual can get lost, even in its enormous space. Escorted by my smiling Singaporean hosts, NG Koon Ling and Chia Wan Fen, I meet Robin Goh – whose impassioned narrative outlines what has made the airport the success that it is. In fact, it was voted the World’s Best Airport by air travellers for the second year in a row at the 2014 World Airport Awards. We tirelessly walk around the many verdant spaces that dot the airport. Prominent amongst its nature trail are the butterfly and sunflower gardens, the orchid garden and koi pond, and the enchanted garden. The last offers an interactive experience – walk across its space and it comes to life as motion sensors trigger natural effects. All the walking soon makes me hungry. Having grabbed bites at Thai Express the previous night and with a visit to Hard Rock Café being scheduled for the next day, we opt for some local flavour at Seafood Paradise in the public area at Terminal 2 for lunch. The dishes innovatively showcase seafood and Chinese cuisine with a strong Singaporean identity. I dip lavishly into the roast duck slices with mango. Amidst the offerings – the chicken in black bean sauce, the tofu in chilli crab sauce – the icing on the cake proves to be the jumbo prawns enveloped in a wasabi mayonnaise topped with salmon roe. For me, the highlight of Terminal 1 is the world’s largest kinetic art sculpture. 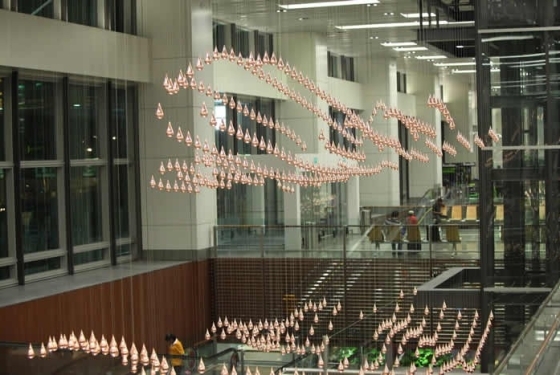 Termed Kinetic Rain, this installation comprises 1,216 bronze droplets that move in a carefully synchronised dance to form the shape of a plane. I stand there gazing at the delicate drops for minutes. The next morning, I am driven down from the hotel to The JetQuay CIP Terminal – the exclusive dedicated airport terminal at Singapore’s Changi Airport. If you choose to use JetQuay, I am told, you get personalised services, including check-in baggage handling and immigration clearance – and, of course, other facilities too, along with the option of relaxing and rejuvenating yourself in its private, plush space. Time for some soulful relaxation and I pay a visit to the Wellness Spa, Terminal 2, where I am lulled into a state of serenity by an hour-long massage. In fact, I am gently awoken by the attendant offering me a cup of refreshing green tea. Time loses its meaning as I continue to meander in and out of the airport’s ‘runways’ within its terminals – the long passages that take me from one outlet to another for food, shopping or for simply snoozing. And, I actually even do that for a few minutes in the Snooze Lounge. This short power nap recharges my batteries and spurs me onto my shopping spree. I first wander around the terminals shortlisting what I want to buy – picking up some stuff on the spot – and then a few days later, as I prepare to depart, I check in early enough to go for the kill as a plethora of brands clamour for attention. The bags I carry in my hand while boarding my flight are sufficient evidence to prove that I have succumbed to a shopaholic’s seduction. And as my flight takes off for Mumbai, a thought recurs in my mind – this is one airport I wouldn’t mind being marooned in! Read about the writer’s Singapore journey here.